Little black dresses, otherwise known as LBDs, are a girl’s best friend. They are timeless, elegant, always on trend, flattering and truly just boost a girl’s self esteem! Who else agrees, when you feel good, you look good? I think a little black dress is always the answer when you don’t know what to wear but want to look put together! I have always loved LBDs! They are perfect to wear to any special occasion, date night, girls night out and there are so many options out there for styles now! I love to find the classics, the flirty ones, and this one is my absolute new favorite!! Plus it’s under $15, not even kidding!! I mean, give me all the ruffles & mesh polka dot details…a girls dream, am I right?! After becoming a mom I honestly hadn’t put a little black dress on in years and now I’m wishing I had bought one way sooner! 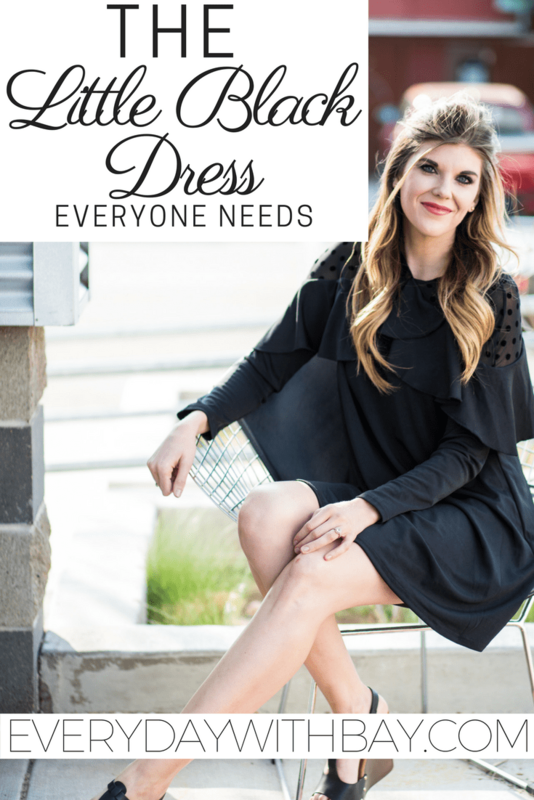 I suggest finding a little black dress, putting that little gem in your closet and get to rocking’ it! I promise you will reach for it more than you ever imagined. I seriously feel so “fancy” in mine even though it seriously is one of the most comfy things I own! So get out there, find you a LBD, throw on some heels and go on a date with your man or get out for some girl time! You will feel great and you’ll exude a new found confidence that you might be missing from your daily norm! I absolutely love this dress!! !